Home Aliexpress e-commerce Aliexpress 11/11 Global Sales Festival.. Are You ready? Aliexpress 11/11 Global Sales Festival.. Are You ready? Aliexpress, one of the world's biggest online marketplace is bringing to you a big sales events on 11th November 2015. Various items are going to be sold at amazing discounts that will surprise you. I have been using Aliexpress for some time now and I must tell you they are very reliable and the good thing is that they offer free deliveries on most of their goods to Nigeria. There are various ways in which you can enjoy from this awesome event. You can download the app and win up to $100 free coupon upon registering, you can also participate in games and exchange your coins for free coupons, there is also a wishlist promo where you share your wishlist and get up to free $50 coupon. All you have to do is head up to www.aliexpress.com and register and start adding items to your carts and await the 11/11 sale! If you are lucky, you can win as much as $100 coupon so hurry now!! 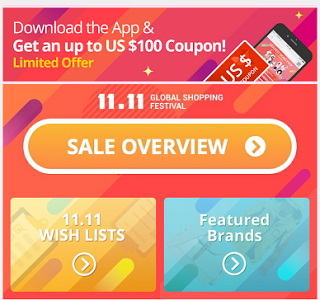 Gearbest too will be doing global sales on 11.11. Gearbest is the ultimate gadget store which brings you the best gadgets at affordable prices. You can check them out on www.gearbest.com . Don't forget, Black Friday is coming on the 27th of November 2015. Start saving for Konga yakata and Jumia Black Friday promos. Anticipate!!! If you are having problems placing an order on any of the sites you can leave a comment or send a mail, i'd be willing to help. HAPPY SHOPPING!! !